If you are a high functioning person who is wanting to decide if ayahuasca can help you resolve old habits that are holding you back, finding accurate information on this internet is all but impossible. How can you make an informed decision if you can’t find accurate information? As someone who has been going to Peru to work with Ayahuasca for personal and professional development for over 10 years, I have scoured the internet, watched the documentaries, read the articles and books….to find recommendations I can pass onto my clients and friends. To be honest, there aren’t many I would recommend (and because of this, I am in the process of writing some guides and online programs of my own…stay tuned). 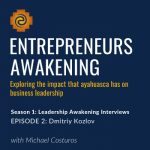 I have led more than 100 entrepreneurs to Peru for their first ayahuasca retreat and since this book became available my clients have been able to get more value from their experience. The specific perspectives and cultural contexts that Javier constructs for the ayahuasca seeker are both accurate and very helpful. My clients who have read this book feel more relaxed and empowered as they step into their first experience than the ones who haven’t. Not surprisingly, after their first experience the ones who didn’t read it eagerly do and benefit immensely from what they learn. Just last week I was in Peru testing out a new retreat center and ayahuasquero. I used it as an opportunity to reconnect with the material in Javier’s book and was happily surprised by how much I benefited from it. For the more experienced voyager, he weaves in a lot of subtle teachings and humor that I didn’t notice the first time through. P.S. Personally, I appreciate the audio version read by the author. You can feel his care and connection to the material. P.S.S. I am now accepting applications for my Men’s Amazon Ayahuasca Mastermind – A 14-week men’s mastermind program for entrepreneurial business leaders who want to take a quantum leap forward in their personal, professional, and spiritual lives. Earlybird deadline is December 15th, so you may want to check it out now.